Gold Prices in 2013 to Go Higher Thanks to These "Wars"
Subject: Gold Prices in 2013 to Go Higher Thanks to These "Wars"
Gold prices in 2013 are already expected to top $2,200, and adding fuel to that price surge is an accelerating trend in the global economy. We're talking about currency wars. The term currency wars describes a race between many of the world's central banks to make their currencies worth less relative to other currencies, with the goal of increasing exports by making them cheaper. Such a strategy becomes less effective as more countries join in the battle, but a growing currency war has another effect that investors can exploit: As central banks devalue their currencies, they create inflation and cause hard assets like gold to rise against them. Fortunately for gold investors, most of the world's central banks, from the U.S. Federal Reserve to the Bank of Japan, are expected to further step up their currency devaluation in 2013. "Implementation of the European Central Bank's Outright Monetary Transactions, andfurther Bank of Japan easing — both of which we expect – [will] support gold, aswould a weaker outlook for the yen, which competes with gold as a flight-to-qualityasset," wrote UBS analyst Edel Tully in a recent research note. While the central banks' easy money policies have been aimed at stimulating their own sluggish economies, the effect has been to strengthen other world currencies, particularly those in emerging markets. That has made their exports more expensive, hurting their economies. And they've had enough. "Advanced countries cannot count on exporting their way out of the crisis at the expense of emerging market economies," Brazilian Finance Minister Guido Mantega said at an International Monetary Fund Meeting last week. "Brazil, for one, will take whatever measures it deems necessary to avoid the detrimental effects of these spillovers." 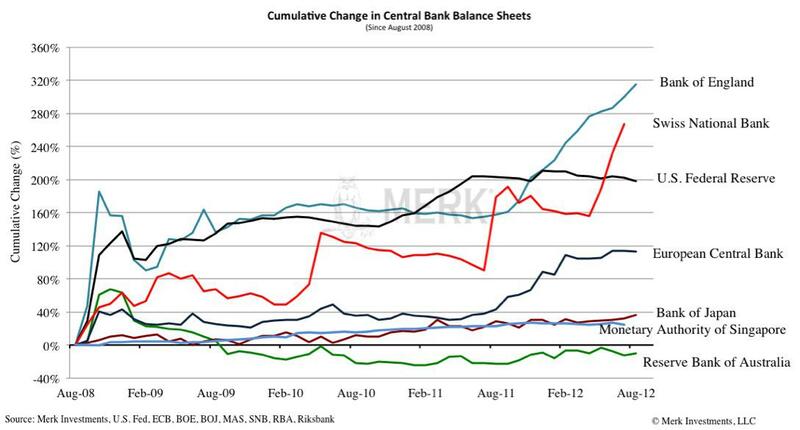 Mantega singled out the Fed in particular, calling its bond-buying QE3 (quantitative easing) program "selfish." Emerging economies are also uneasy about the recent election of Shinzo Abe as Prime Minister of Japan. Abe and his Liberal Democratic Party are expected to push for as much as $120 billion of stimulus spending plus call on the Bank of Japan to print piles of yen. "It's almost obscene what they're talking about doing," John Mauldin, chairman of Mauldin Economics, told The Daily Ticker. He added that with a shrinking and aging population less able to absorb Japanese Government Bonds (JGBs), "they're going to have to print and print in size and level that will make what Fed and European Central Bank [have done] look small." As the slow global recovery continues to put pressure on central banks in both developed as well as emerging economies, an escalation of the currency wars in 2013 appears unavoidable. "You can see, month by month, the number of countries who feel that active exchange rate management, always to push their exchange rate down, is growing," Bank of England Governor Sir Mervyn King warned in a speech at the Economic Club in New York earlier this month. "My concern is that in 2013 we'll see the growth of actively managed exchange rates as an alternative to the use of domestic monetary policy." Inflationary currency wars aren't the only way central banks are helping drive up gold prices. For the past two years, many central banks have also been buying up more and more physical gold, partly as a form of defense in the currency wars. "Central banks, especially in developing nations, are buying and hoarding gold at a breakneck pace," said Money Morning Global Resources Strategist and Real Asset Returns Editor Peter Krauth. "So far in 2012, they've bought 493 tons, already surpassing last year's 457 tons. Many believe this is part of a long-term trend, providing solid support for gold prices in 2013." Krauth believes the actions of central banks, plus several other factors, will push gold prices to $2,200 in 2013. For more on where gold and other commodities are headed in 2013, click here. With gold prices rising in 2013, the only remaining question is how best to profit from the situation. Because it's not always easy for retail investors to buy commodities like gold and silver directly, those seeking to profit from the 2013 currency wars might want to look at mining stocks and exchange-traded funds (ETFs). The largest and most popular gold ETF is the SPDR Gold Trust ETF (NYSEArca: GLD). The price of GLD shares, which are backed by physical gold and issued in blocks of 100,000, generally tracks the price of one-tenth of an ounce of gold, usually trading at a slight discount. It's also highly liquid, with an average daily trading volume approaching 2 million shares. Another option for those with smaller budgets would be the iShares Gold Trust ETF (NYSEArca: IAU). Its shares are also backed by physical gold, but they're priced at just 1/100th the price of an ounce of bullion, also typically trading at a small discount. The fund has a market cap of about $9.42 billion and a daily trading value of around 300,000 shares. Super gold bulls can also try leveraged funds designed to produce price moves double or even triple the percentage moves in gold itself. An example is the Deutsche Bank AG Gold Double Long ETN (NYSEArca: DGP). It holds some physical gold but primarily employs futures and options in a bid to produce percentage gains double that of gold itself on any up-move. Of course, losses on pullbacks are also magnified. Gold miners have not risen proportionally to gold prices over the past year, but that could change in 2013, Krauth said, as previous investments in expanding their reserves begin to pay off. IAMGOLD Corp. (NYSE: IAG): After falling 29% in 2012, this gold miner has a low P/E of 11and should be ripe for a reversal as gold prices climb. Its one-year average price target of $17.51 is a 56% increase over its current price of $11.24, and the stock pays a 2.2% dividend. Market Vectors Gold Miners ETF (NYSEArca: GDX), which tracks the New York Stock Exchange's Gold Miners Index of U.S.-listed companies with a market cap of at least $100 million. This fund gives you a piece of such top miners as Barrick Gold (NYSE: ABX) and Newmont Mining (NYSE: NEM) without having to worry about the specific characteristics of the individual companies. Van Eck International Investors Gold Fund (MUTF: INIVX), a classic load-waived mutual fund that focuses on global miners with an emphasis on companies with substantial in-ground reserves. Current valuation is about $1.4 billion; the fund also provides a 1.58% dividend yield.